The young turkey vultures are fledglings now. Each day they hop up on branches, stretch and flap their wings. I promise some more videos, they have been so active I have a lot of video feed to sift through. The fledglings are about 9.5 weeks now. They stretch their wings often. The downy white is almost all gone. At this age, they have more black in their dark brown than their parents. 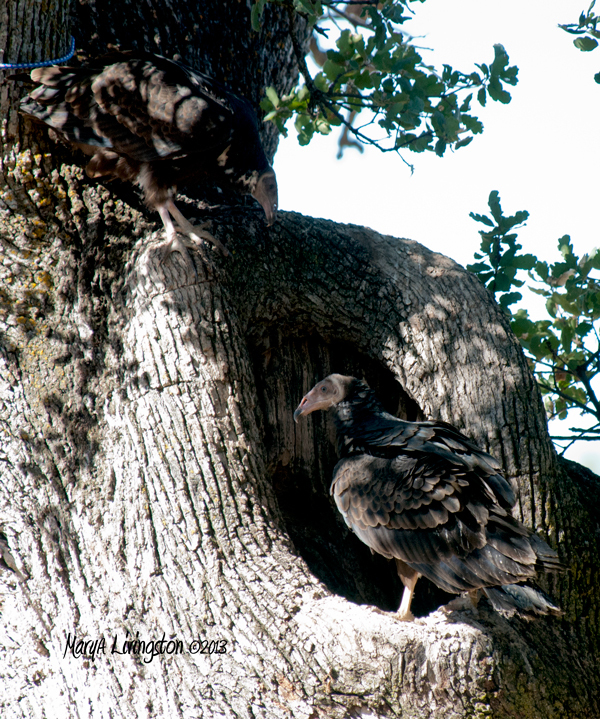 The turkey vulture siblings spend a large part of their day out of the nest cavity. 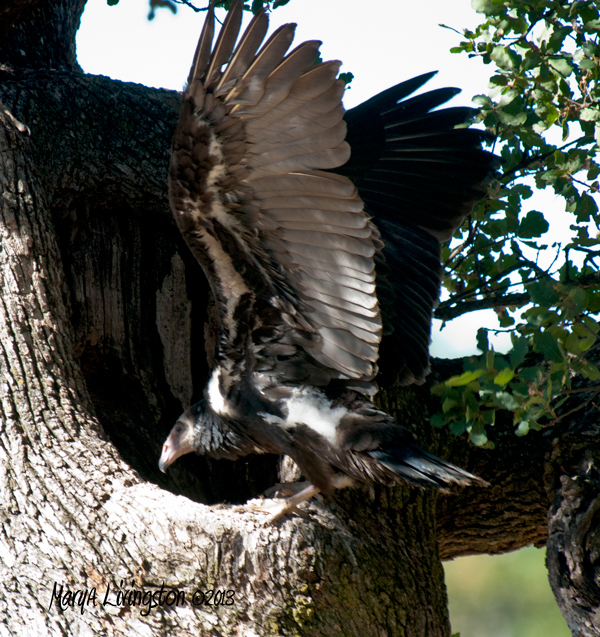 This entry was posted in My Backyard, Nature Art, Photography, Turkey Vultures and tagged chicks, fledge, practice, turkey vulture fledgling, ugly birds, vulture, wings by MaryALivingston. Bookmark the permalink. That first picture is stunning. sometimes when they flap their wings they look like they might fall out of the tree. Bravo for your nature study and for sharing it with us. It is very interesting to go through the footage, next year I will have be sure the camera has sound. You are correct in that turkey vultures are nesting opportunists. They will even nest on the ground. I don’t know if the the same pair reuses the nest. They are not well studied. The Q&A went well, a lot of questions. The replay is up. They’ve become quite handsome really! I took a vary nice face shot yesterday with a nice view clean through the nostril. I will have to post it with some video. This is really very exciting! Thanks for the updates! You’re going to miss your babies when they leave the nest, aren’t you? Nope – I will have more time to create and paint! Didn’t miss the people ones when they left the nest either.